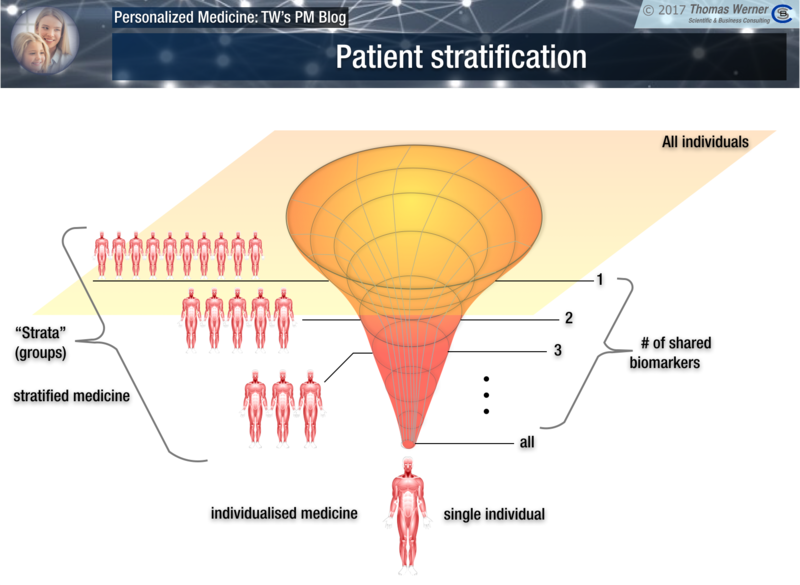 Patient stratification is defined in personalised medicine as subgrouping patients into “strata” (groups) based on individual biological information. This is not necessarily restricted to one individual person but can also refer to certain conditions/biomarkers shared by groups of patients. In this case it should be more precisely called group stratification. This type of stratification usually relies on genetic variations but comes in two flavours. The genetic setup of the person can be considered (germline genome) for permanent disease-relevant aberrations. This can be used to select an appropriate intervention. This does not always refer to medication since behavioural or nutritional interventions are an important part of the preventive branch of personalised medicine. The second genetic approach is based on non-germline, so called “somatic” mutations. These are usually found in tumours which change the genetic setup of the tumour cells but not that of non-tumour tissues. If tumour samples are available either from a biopsy of the tumour or by so called “liquid biopsy” in the form of circulation tumour cells from the blood of the patient, tumour-specific somatic mutations can be detected. Along the same lines also epigenetic changes (not changing the DNA sequence) can be assessed from these samples. Epigenetic changes are much more wide-spread that DNA mutations and are essential for the reprogramming of the cell to a malignant tumour cell. Both of these approaches are based on the identification of predefined prospective biomarkers. Prospective biomarkers are usually small in number and associated with some percentage of risk for a particular disease. 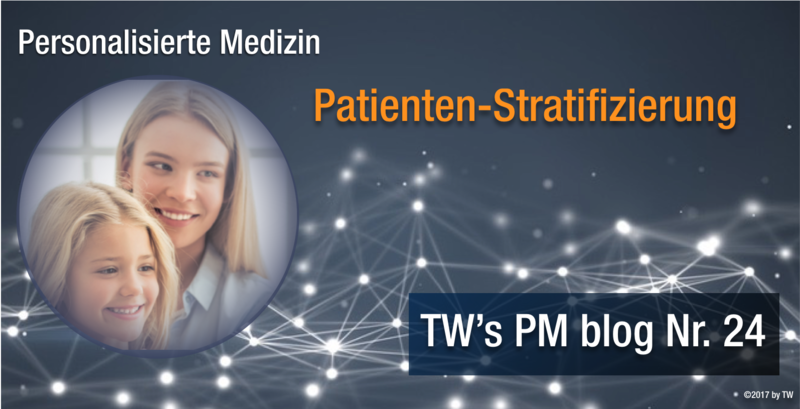 The other part of patient stratification is carried out after the intervention, usually to assess the effect of the intervention on the patient. Post-intervention stratification aims at many more biomarkers identified by changes induced by the intervention. This allows retrospective biomarker identification based on the results. Any intervention is changing a broad range of biological parameters in a person. This is the reason why post-intervention stratification usually also assesses many more parameters that prospective biomarkers. There are two areas where the most-widespread changes can be observed: Metabolomis and epigenetics. Changes in the metabolome and the epigenome are already used for post-intervention stratification (e.g. responders vs non-responders, type and severity of side effects, etc). If there are multiple interventions such as a long-term therapy metabolomic and epigenetic screening can be used to monitor the results of the treatment on a molecular level. There are two more -omics fields that react rapidly and profoundly upon interventions: The transcriptome and the proteome of a person or tissue. I am sure these fields will be added to the post-intervention stratification. The associated technologies are not yet straight-forward enough for routine application. However, it will be only a matter of time until all -omics fields will be routinely assessed fro stratification. Next week I will focus on the definition of individualised medicine, the most “truely” personalised medicine imaginable.